In an unprecedented move in the local pumps industry, pumps distributor Integrated Pump Technology (IPT) announced the extension of the warranty on Grindex submersible pumps from 18 months to 30 months at Electra Mining Africa 2018. While quality has always been the watchword with Grindex submersible pumps, Adams notes that performance and reliability go hand in hand in pumping applications and, for this reason, it is critical that the most appropriate pump be selected for a given application. “IPT is not about selling a pump in a box. “We consider it important to understand the customer application and its specific requirements and, with this information, our technical team is able to specify a pump which we know will match the requirement. “By leveraging off our extensive knowledge of pumping application, we can ensure effective performance with lower total cost of ownership. And this is definitely not something that all pumps companies can do,” he points out. IPT’s operating philosophy is founded on providing quality original-equipment manufacturer (OEM) pumps and parts and it has established a sound reputation for pumping solutions under all types of operating conditions. Adams says the company’s offering extends well past simply selling pumps to providing technical and aftermarket support to end-users, which, he says, has been a value differentiator in the industry. “When specifying a Grindex pump, we know that the end-user will see a return on the investment, and this is largely owing to the extensive research and development that underpins all the engineering of all the pumps offers by this international OEM,” he notes. The Grindex Bravo range has found “particular favour” in slurry pumping applications in the mining sector as these pumps are designed for moving fluids with high concentrations of abrasives, including sand and stones. Robustly constructed, these hardworking pumps offer a maximum submersible depth of 20 m and do not require any support superstructure. This makes for quick and easy installation and less space needed for their operation. The cartridge seal is preassembled for quicker and easier mounting, while the hard-iron impeller and pump housing feature high wear resistance, which is critical in slurry applications. The large throughlet means that the pump can handle solids of varying sizes. A leakage sensor allows for early detection of any problems, while the single adjustment screw makes it easy to tweak the impeller for optimal performance. The agitator has been designed specifically for coarser slurries, and is able to stir up and pump sand, sludge and solids in suspension. 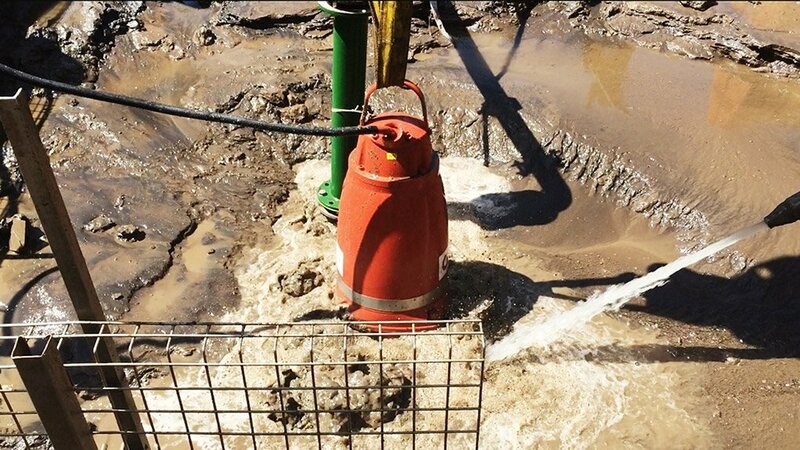 “Handling slurries is certainly one of the toughest pumping applications and we know that the market looks to suppliers like us to offer appropriate products with good value-add. “By further extending the warranty on the Grindex pump, we anticipate even greater demand for this workhorse pump,” Adams concludes.